Remember the Galaxy View? No? Allow us to rejog your memory. The Galaxy View was a massive Android tablet that Samsung launched nearly three years ago, following an exclusive reveal of the device’s pictures here at SamMobile. The idea was to offer consumers a movable display that isn’t as big as a television but isn’t as small as regular tablets, but the overall implementation left much to be desired. 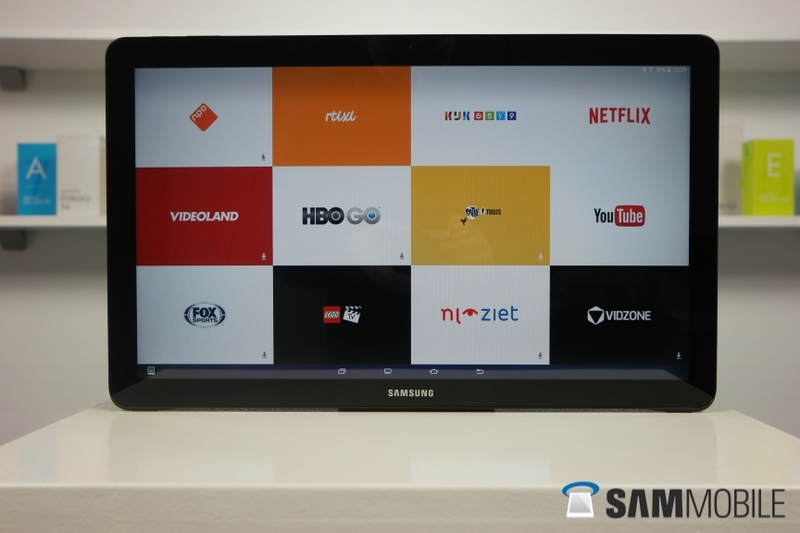 And, according to Android Police, Samsung is finally preparing to unleash the Galaxy View’s successor. Galaxy View 2 finally on the way? According to Android Police’s source, the Galaxy View 2 (most likely a tentative name) will have a 17.5-inch display, slightly smaller than the 18.4-inch display of the original. It has a built-in book-like hinge that acts as the stand in two different configurations. The closed configuration raises the screen up at around a 30 degree-angle like a drafting desk, while the open configuration will make the screen stand upright like a laptop. There’s apparently no handle on the View 2 unlike the original Galaxy View, so it’s possible it will have to be carried around as a laptop when the hinge is completely closed. In terms of specs, the Galaxy View 2 is reportedly going to be in the mid-range category like its predecessor. It could have an unknown Exynos SoC, Full HD display resolution, and 3GB of RAM. Android Police also mentions something about a “novel multi-window functionality” in the software. We’re guessing that would be similar to the Pop Up Window feature or the ability to have more than two apps running side-by-side. DeX support is said to be missing, but that shouldn’t be surprising considering Samsung is only offering DeX functionality on flagship devices. It will, however, run Android 8.0 Oreo out of the box. The Galaxy View 2 is reportedly headed to North American carrier AT&T, although a launch in other regions might happen as well (this is our own speculation). Not that a limited launch would disappoint many, as there isn’t exactly much demand for 17-inch mid-range Android tablets. The original Galaxy View was also priced a tad exorbitantly for what it offered. Android Police doesn’t have anything to offer in terms of pricing or release date information, however, so we will have to wait and see how it all pans out. Would you be interested in the Galaxy View 2? If it comes with Chromecast receiver built-in and a HDMI input to act like a monitor.